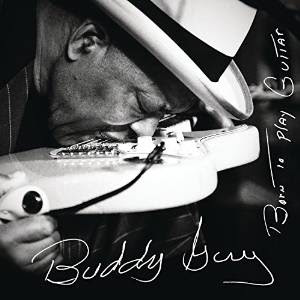 I just received the newest release, Born To Play The Blues, from Buddy Guy and it's terrific! Opening with title track, Born To Play Guitar, Guy starts at his roots with a primitive blues track with basic blues picking supplemented by Rob McNelley on resonator and Guy on strat and super blues vocals. Terrific start! Wear You Out is a great boogie featuring Billy Gibbons trading vocals and guitar riffs with Guy. Backed by Tom Hambridge on drums, Rob McNelley on guitar, Kevin McKendree on Clav and Glenn Worf on bass this track rocks! Classic styling on Back Up Mama features McNelley on slide and Guy on strat trading riffs. Buddy is just such an exceptional performer and his vocals are tight. His calling card frenzied guitar riffs kick this track in the back side giving it that extra punch and McKendree's piano is tight. Kim Wilson joins Guy on swing track, Too Late. His harp riffs blend nicely with Guy's vocals. Whiskey, Beer & Wine has a great groove driven by Doyle Bramhall II, McNelley, Hambridge and Michael Rhodes (on bass). Reese Wynans lays in some real nice B3 and Clav and Guy switches off to an uncharacteristic ES335 for a rounder tone blending nicely with his vocals. Shuffle track, Kiss Me Quick, shows some of Guy's best vocals on the release and his guitar tone from the 335 have a real nice roundness. Kim Wilson adds some hot harp riffs and McKendree's piano work is hot! Crying Out Of One Eye is a cool track with a trace riff from Otis Rush. With an overall R&B feel, this track has a clever concept in title. It reminds me of something that I supposedly said to my parents when I was a kid "I'm laughing on the outside but crying on the inside" as I was taking my punishment for a bad deed. Guys uses the one eye crying for the foolishness of someone who really doesn't hurt. I really like it. With it's almost BB King like guitar riffs and backed by the Muscle Shoals Horns this track packs a punch. On classic R&B track, Baby You Got What It Takes, Guy is joined by Joss Stone and her vocals are clear and sweet as honey. I'm not a big "star collaboration" guy, but Stone has joined another of my favorites, Jeff Beck, on his performances and in both cases she has shown not to be just a calling card on a piece of paper but a real cool singer who can hold her own with the real heavyweights. Turn Me Wild has a real nice strut with Guy nicely punctuating his own vocals on guitar and Billy Cox driving the groove on bass. Some of the slickest guitar work on the release is on this track with Guy taking his strat for a nice walk. Crazy World is an easy soulful ballad with Reese Wynans holding the course with B3 and Guy just singing his guts out. Short meaningful guitar work by Guy is smooth and articulate with a lot of grip. Smarter Than I Was has a vibrant rhythm part by Hambridge, and a cool underlying guitar part by Rob McNelley... and crisp guitar bursts from Guy set this track on fire. Excellent! The big R&B hammer is dropped with Thick Like Mississippi Mud. "Good Whiskey and Women"... shoot...you got me already! Guy gets into one of his classic grooves (Think Damn Right I've Got The Blues) and there's no holding him back. Guy works up a real guitar frenzy on this track literally blowing the lid off! McKendree on piano, Worf on bass and the Muscle Shoals Horns prod him along and he responds with flames! Easy going ballad, Flesh & Bone, in concert with Van Morrison is a nice ballad of both men's style. Trading lead vocal spots, this is probably (after Thick) the most radio likely track on the release. Thick because of it's power and F&B because of it's natural tenderness and melodic sensibilities. Wrapping the release is Come Back Muddy, a stripped down blues number featuring Wymans on upright piano, Bramhall II on 12 string, Michael Rhodes on electric bass and Guy on acoustic guitar and vocal. Classic blues chords and lines give it a primitive feel but it's "modern Guy" getting into a real nice acoustic groove with tight guitar solo's. The release is opened in easy style and closed in easy style. This is a really nice release from Guy and one with a lot of heart. Check it out! This really and It's reminds me of something that I supposedly said to my parents when I was a kid I'm laughing on the outside but crying on the inside as I was taking my punishment for a bad deed.